Sheets Studio, Historical Triptych for Torrance Home Savings, 1979. Frank Homolka, Architect. Here’s another image from my days driving around LA and Orange counties, scouting out Home Savings locations I hadn’t seen before. As we saw last week at Rolling Hills / Rancho Palos Verdes, the designs after the mid-1970s begin to experiment with new forms, new themes, and new shapes for the artwork. Whether this reflects the ideas of the new Home Savings management after Howard Ahmanson’s death in 1968; the changes related to Frank Homolka becoming the primary architect for Home Savings buildings; and/or changes coming from Denis O’Connor and Sue Hertel as Millard stepped back from the day-to-day involvement with this artwork, we can discuss. I have written earlier about the use of the historical triptych by Denis and Sue in their own, 1980s commissions for Home Savings, but looking back at my Torrance pictures today, I was struck not only by the asymmetrical, cut-out-of-travertine shape you see here (a feature also present in contemporaneous Sheets Studio work for Van Ness in San Francisco and Tujunga) but by how this image–described in the shorthand in the Sheets Papers correspondence as “Rancho San Pedro, Red Car maintenance, family living” demonstrates that historical arc we see at Northridge–European origins in the region; classic Victorian-era nostalgia; something modern—for what I think is the first time in Home Savings art. According to the files, there were wall hangings there once, likely long gone. But this triptych will stay with me, know, as another subtle-but-important “first” in the evolution of the Home Savings art style, and its integration of local history. 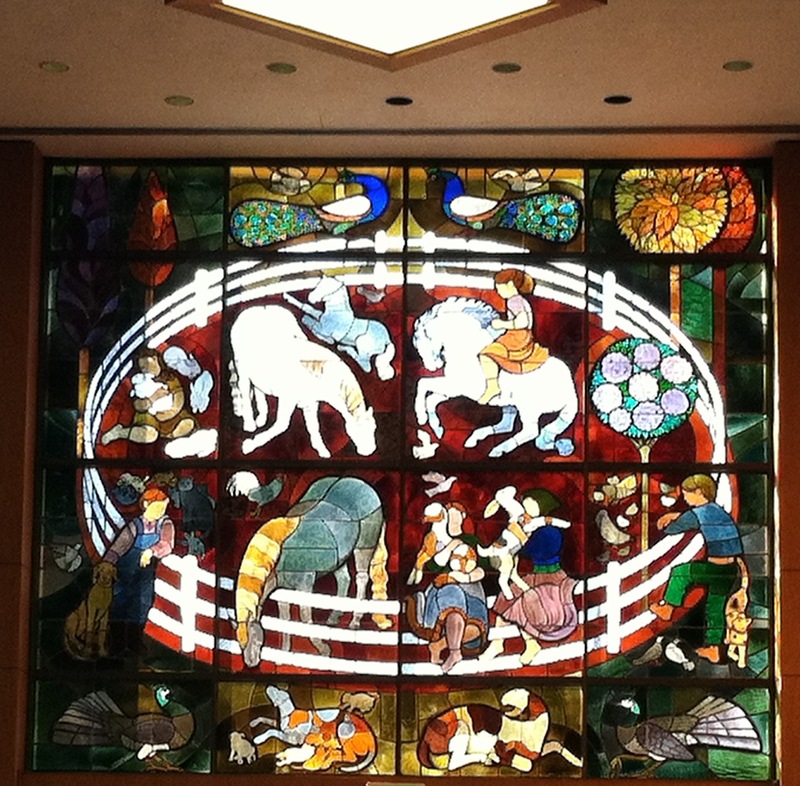 Sheets Studio, Home Savings Rolling Hills, leaping dolphins sculpture and horses mosaic, 1974, Photo by Adam Arenson, 2012. 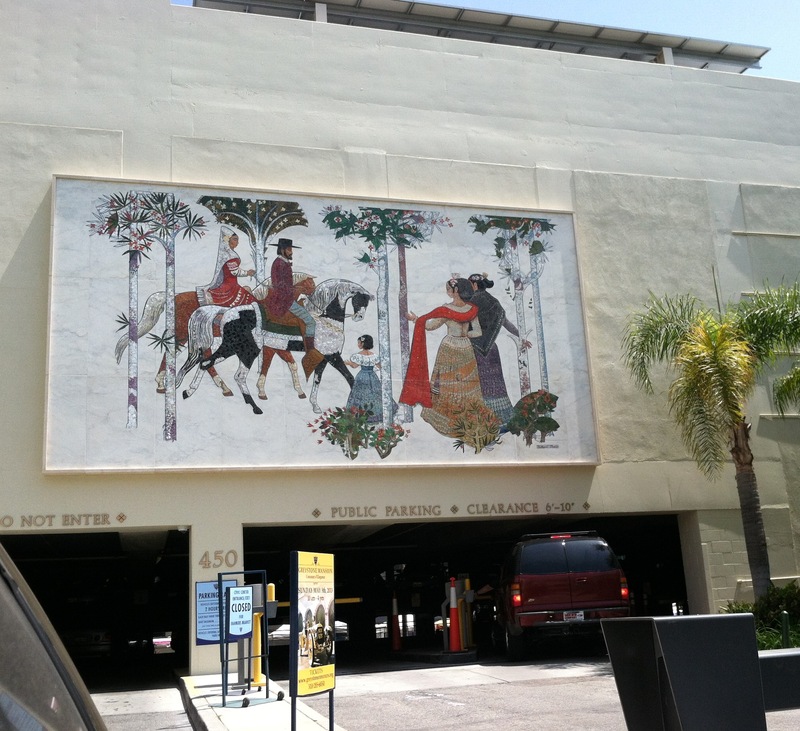 As I mentioned last week, the Sheets Studio granite supplier, Carnevale & Lohr, has played a key role in the preservation and restoration of Home Savings mosaic art — first at this site, in Rolling Hills / Rancho Palos Verdes, and then in the re-installation of the Beverly Wilshire mosaic. Opened on May 8, 1974, this branch holds art in three forms: the mosaic, credited to Millard Sheets on the wall and Nancy Colbath, Denis O’Connor, and Sue Hertel in the files; John Edward Svenson‘s leaping dolphins, forged in Oslo; and the stained glass, inside, a collaboration between Hertel and John Wallis Stained Glass. Sue Hertel and John Wallis and Associates, stained glass for Rolling Hills, 1974. Photo by Adam Arenson, 2012. The result, I think, is one of the most beautiful branches, just down the hill from the stunning views of ocean and shore that crown Rancho Palos Verdes. The size and complexity of the work leads to a large file in the archives, but the effect is simple–an improvement on existing Home Savings forms. I was particularly struck by the stained glass, as I think I had never seen it, whereas the leaping dolphins make the front of the branch quite iconic. The innovations in the forms–new background material; combining sculpture imaginatively with the mosaic wall of sea foam; and the use of a more naturalistic color palette with a traditional set of children and domestic animals–suggests subtle adjustments to traditional Sheets Studio-Home Savings artwork, the kind of tinkering made possible by artists secure in what was expected of their work but trying not to be bored. The surprise of the stained glass is another reminder how, like so much excellent architecture, even the repetition of form and style can hold surprises in a new context. 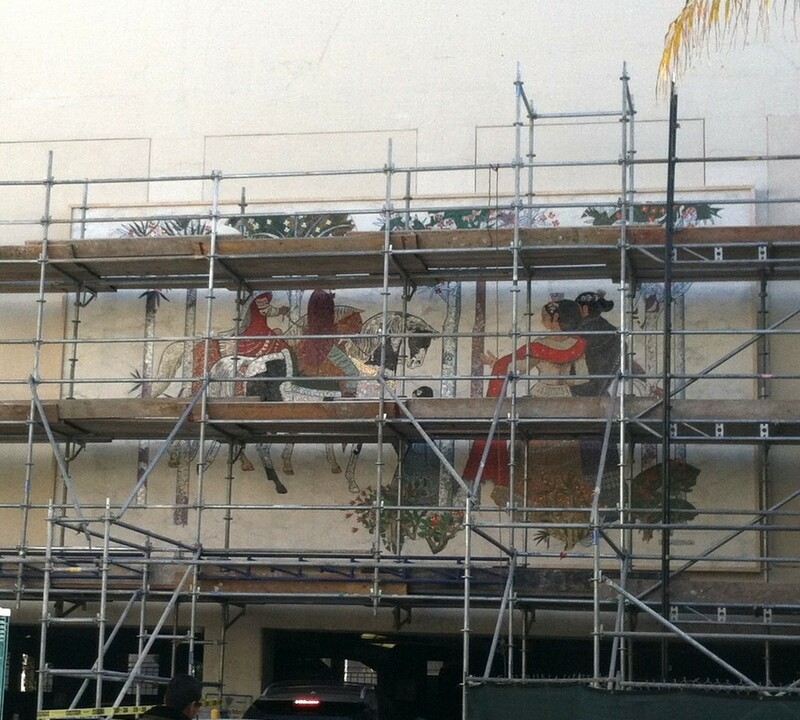 Beverly Wilshire Hotel mosaic being reinstalled at Beverly Hills Civic Center, 2013. After a bit of a delay, I am back with posts — and this week’s post is guest-posted at KCET’s SoCal Departures Writing on the Wall blog, thanks to an invitation from Ed Fuentes. So click over there to see pictures of the Beverly Wilshire Hotel‘s Millard Sheets Studio mosaic as it once was, and now as it is being re-installed in at the Beverly Hills Civic Center! UPDATE: This week I saw that the installation is done, and it looks great!